- Lightweight open-air headphones are comfortable to wear, even for extended periods; also allow you to hear ambient sound. 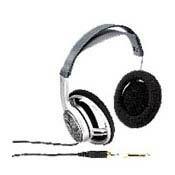 - Unique cirum-aural design provides an excellent fit for any size head; allows for fatigue-free listening. - Oversized 40 mm diameter drive units are larger than most headphones for noticeably deeper bass, lower distortion and wider dynamic range; frequency response extends down to an amazingly low 12 Hz. - Neodymium magnets for maximum energy and minimum size; Neodymium packs more magnetic energy per ounce than conventional Ferrite, Samarium Cobalt or Aluminum magnets; help produce ample sound output-106 dB sensitivity. - PET diaphragms ensure high rigidity for minimum distortion; low mass for high-frequency response all the way out to 22,000 Hz. - Sony Acoustic Turbo Circuit for high efficiency; gets high sonic output from your portable stereo; extends bass response. - Self-adjusting headband conforms precisely to the curve of your head for a fit that stays comfortable, even after listening for hours on end. - Angle-adjustable housing pivots the earcups for maximum comfort. - Soft cloth earpads pamper your ears for hour-after-hour listening. - Sony UniMatch plug with fixed mini plug for portable use and screw-on phone plug for home use. - Gold-plated plugs to help resist corrosion for high conductivity, low noise. Once, when visiting CES in Vegas I’ve tried some Sony cans that look exactly like these. (Stupid me, never wrote model number down). Sound was amazing and fit very comfy. So when I found 605 on BUY.COM it was no brainer. To my great frustration 605 I got was total … no good. They simply didn’t produce anything above 8 KHz!!! Mids sound very resonant and bass causes loud claps with slight overload! What garbage! Avoid these! F.U.I – I owe original MDR-V600 that I adore. Amazing looks, great feel, comfort greatly excels that of closed studio monitor sonys that I've tried. Great bass, good mid. Overall, I like these heaphones. They feel great, don't overheat your head, the bass and mid is awesome, and the trebles are almost TOO good. Those neodymium magnets are really piercing with the treble. So just crank the bass, and tone down the trebel. Then they are perfect. Lots of sony studio monitors... new and old senn's.... I've had a pretty wide ranging experience.